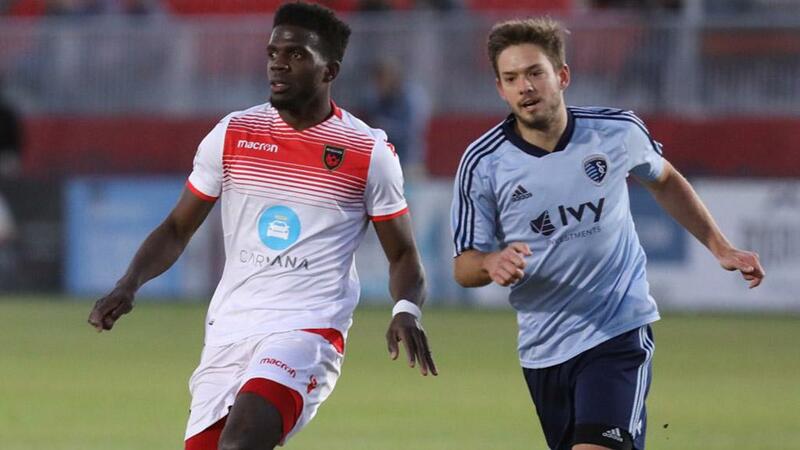 PHOENIX – Both Kevon Lambert and trialist Lamar Neagle found the net for Phoenix Rising FC, but it wasn’t quite enough to earn a result in a 3-2 loss to Major League Soccer’s Sporting Kansas City on Thursday night at the Phoenix Rising Soccer Complex as the sides met for a 150-minute scrimmage at the USL Championship club’s home venue. The opening 45 minutes ended scoreless, although both sides had chances. SKC’s Krisztian Nemeth nearly opened the scoring twice, only to send a low effort inches wide of the post, and then produced a looping header that was well-saved by Rising FC goalkeeper Zac Lubin. Phoenix newcomer Junior Flemmings had the best chance for the hosts over that span as his powerful shot from the top of the penalty area forced a good save by SKC goalkeeper Tim Melia. Sporting took the lead in the 56th minute through Scottish international Jonny Russell, who took advantage of a turnover before he drove into the penalty area and finished. Phoenix hit back 14 minutes later as Solomon Asante came down the right flank and crossed up his defender to give himself enough space to send a pass into the penalty area that picked out Neagle for a headed finish. Rising FC wasn’t on level terms for long as in the 72nd minute former United States international Graham Zusi put Sporting back ahead with a perfectly-placed free kick into the top-left corner of the net, and a minute into the second 75-minute period 16-year-old SKC Academy product Tyler Freeman added a third for the visitors. Phoenix pulled a goal back just under a half-hour into the second 75-minute segment when midfielder Joey Calistri attacked from the left side. He slid a pass to Lambert to beat a defender and then the Jamaican international curled a well-struck finish in off the crossbar. That would be all the scoring for the hosts, however, as their two-game undefeated streak against MLS opposition came to an end.